The journey through cancer is uphill. To help raise awareness of the public health crisis of breast cancer and raise funds to support prevention efforts, Breast Cancer Prevention Partners (BCPP) and Shasta Mountain Guides (SMG) have organized the Climb Against the Odds event, where novice and expert climbers attempt to summit Mount Shasta — a 14,179’ peak in California. In 2018, Garmin provided technology support for the Climb Against the Odds event so family, friends, advocates and survivors everywhere could follow each climber’s journey. Nick Caselli, operations director at SMG, integrated live tracking data from our inReach® devices used by climbers during the event into Esri’s ArcGIS platform and then created a story map that displayed a multimedia journal of the climb. Nick also embedded a MapShare™ page on the story map site so supporters could choose between following the devices live or viewing photos and updates as they came in from the field. Michael Sevy climbed Mount Shasta during the Climb Against the Odds in 2011 — right around the time he met Mary Mathieu, who would later become his spouse. Since then, Michael and his close-knit CAO rope team encouraged Mary to join their ranks. Having never mountaineered before and hearing Michael’s forewarning of Shasta’s aptly named landmarks such as Misery Hill and the Summit Plateau, Mary knew the CAO was a true commitment of time and training. Mary and Michael finally swapped participant roles in 2018 when Mary climbed, and Michael led the cheering squad. “Fundraising is the easy part,” Mary said. “People will surprise you with their generosity, but you can’t underestimate the endurance and strength required for the climb.” Mary prepared physically with BCPP’s regular training climbs and long runs, and her competitive nature kept her in rhythm with the young guns of the group. Intimidated by neither heights nor punishing switchbacks, Mary only worried that a recurring back injury might force her to turn back early on Mount Shasta. She geared up mentally for the climb with the strength, encouragement and motivation from the seasoned support team by her side. 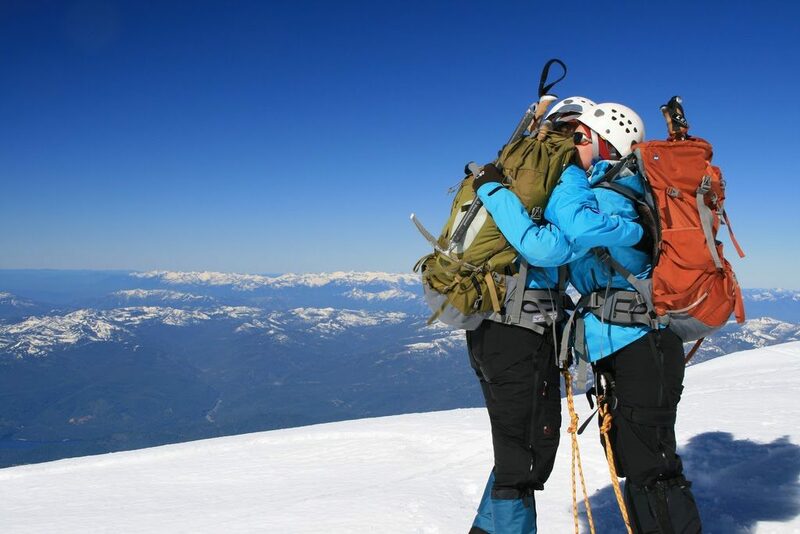 Using inReach tracking and communication technology helped event staff and climbers coordinate field logistics, manage risk and request resources. It also gave Michael and many others a means to follow Mary and her fellow climbing and cancer prevention champions in feat and spirit during their 3-day summit attempt on the Climb Against the Odds story map and MapShare page. “Cheering friends on and following their progress was far different than following Mary this past year,” Michael said. He remembers Mary’s summit like it was Christmas morning. Mary remembers it a little differently. 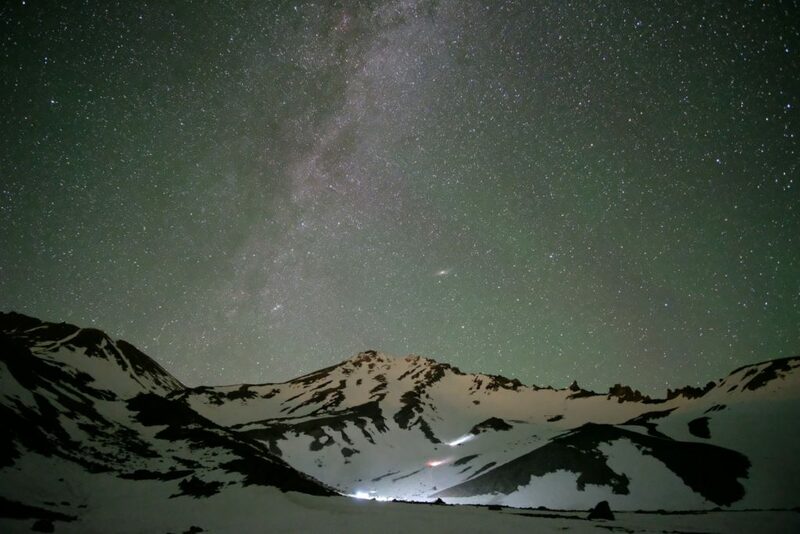 Mary woke in the middle of the night on Mount Shasta for a painfully early alpine start. Due to an impending storm, the window for a safe summit attempt that day was limited, so the climbers moved quickly and efficiently on 3- to 4-person rope teams. Meanwhile, Michael woke every hour until daybreak to watch Mary’s progress. The event story map and MapShare page provided updates of climbers who had turned back to basecamp and of shuffling rope teams, but Mary’s dot appeared to ever so slightly rise toward the summit. At first light, Michael and friends found themselves huddled around screens to watch — in grueling real time — Mary’s inching progress. Mary and her team rose and traversed in synchronized French step up Mount Shasta’s West Face route. When they topped out, Mary recalled seeing the welcoming light of sunrise and her team’s quickening tempo to outpace the shadow of the mountain. Mary’s group made impressive time to the summit, but the 6-hour ascent was only the halfway point of their journey. Firm snow conditions and an approaching storm meant dangerous glissading and a slow descent ahead. Mary and her team’s downclimb took more than 5 hours. Event staff and supporters watched intently during their steady return to basecamp for the night and their early morning departure to the trailhead.